The Supreme Court, on Tuesday, held that foreign law firms cannot set up offices in India or practice in Indian Courts. It, however, clarified that they can advice Indian clients on a "fly in and fly out" basis, not amounting to regular practice. The judgment was delivered by a Bench comprising Justice A.K. Goel and Justice U.U. Lalit, which was hearing appeals challenging Madras and Bombay High Court judgments. The Bombay High Court had, in 2009, held that the RBI was not justified in allowing foreign law firms to establish liaison offices in India. It had then ruled that such foreign law firms can establish their offices in India only after being enrolled as advocates under the Advocates Act, 1961. This judgment had been challenged before the Supreme Court by the Global Indian Lawyers Association. The Madras High Court had, in February, 2012, held that foreign lawyers and law firms cannot practice law in India either on the litigation or non-litigation side unless they fulfill the requirement of the Advocates Act and the Bar Council of India (BCI) Rules. It had, however, held that they may visit India on a "fly in and fly out" basis for advising clients on foreign law. It had further held that there is no restriction against them coming to India for conducting arbitration proceedings in disputes involving international commercial arbitration. This decision had been appealed against by the BCI. Whether the expression ‘practice the profession of law’ includes only litigation practice or non-litigation practice also? "Ethics of the legal profession apply not only when an advocate appears before the Court. The same also apply to regulate practice outside the Court. Adhering to such Ethics is integral to the administration of justice. The professional standards laid down from time to time are required to be followed. Thus, we uphold the view that practice of law includes litigation as well as non-litigation." Whether such practice by foreign law firms or foreign lawyers is permissible without fulfilling the requirements of Advocates Act and the Bar Council of India Rules? "We have already held that practicing of law includes not only appearance in courts but also giving of opinion, drafting of instruments, participation in conferences involving legal discussion. These are parts of non-litigation practice which is part of practice of law. The scheme in Chapter-IV of the Advocates Act makes it clear that advocates enrolled with the Bar Council alone are entitled to practice law, except as otherwise provided in any other law. All others can appear only with the permission of the court, authority or person before whom the proceedings are pending. Regulatory mechanism for conduct of advocates applies to non-litigation work also." If not, whether there is a bar for the said law firms or lawyers to visit India on ‘fly in and fly out’ basis for giving legal advice regarding foreign law on diverse international legal issues? "Visit of any foreign lawyer on fly in and fly out basis may amount to practice of law if it is on regular basis. A casual visit for giving advice may not be covered by the expression ‘practice’. Whether a particular visit is casual or frequent so as to amount to practice is a question of fact to be determined from situation to situation. Bar Council of India or Union of India are at liberty to make appropriate rules in this regard." "We may, however, make it clear that the contention that the Advocates Act applies only if a person is practicing Indian law cannot be accepted. Conversely, plea that a foreign lawyer is entitled to practice foreign law in India without subjecting himself to the regulatory mechanism of the Bar Council of India Rules can also be not accepted. We do not find any merit in the contention that the Advocates Act does not deal with companies or firms and only individuals. If prohibition applies to an individual, it equally applies to group of individuals or juridical persons." Whether there is no bar to foreign law firms and lawyers from conducting arbitration proceedings and disputes arising out of contracts relating to international commercial arbitration? "If the matter governed by particular rules of an institution or if the matter otherwise falls under Section 32 or 33, there is no bar to conduct such proceedings in prescribed manner. If the matter is governed by an international commercial arbitration agreement, conduct of proceedings may fall under Section 32 or 33 read with the provisions of the Arbitration Act. Even in such cases, Code of Conduct, if any, applicable to the legal profession in India has to be followed." Whether BPO companies providing integrated services are not covered by the Advocates Act or the Bar Council of India rules? "The BPO companies providing range of customized and integrated services and functions to its customers may not violate the provisions of the Advocates Act, only if the activities in pith and substance do not amount to practice of law. The manner in which they are styled may not be conclusive. As already explained, if their services do not directly or indirectly amount to practice of law, the Advocates Act may not apply. This is a matter which may have to be dealt with on case to case basis having regard to a fact situation." With such answers to the questions posed by it, the Court upheld the impugned judgments, ruling that foreign law firms/companies or foreign lawyers cannot practice profession of law in India, neither in the litigation nor in the non-litigation side. "In case of a dispute whether a foreign lawyer was limiting himself to “fly in and fly out” on casual basis for the purpose of giving legal advice to their clients in India regarding foreign law or their own system of law and on diverse international legal issues or whether in substance he was doing practice which is prohibited can be determined by the Bar Council of India. However, the Bar Council of India or Union of India will be at liberty to make appropriate Rules in this regard including extending Code of Ethics being applicable even to such cases." "If the Rules of Institutional Arbitration apply or the matter is covered by the provisions of the Arbitration Act, foreign lawyers may not be debarred from conducting arbitration proceedings arising out of international commercial arbitration in view of Sections 32 and 33 of the Advocates Act. However, they will be governed by code of conduct applicable to the legal profession in India. 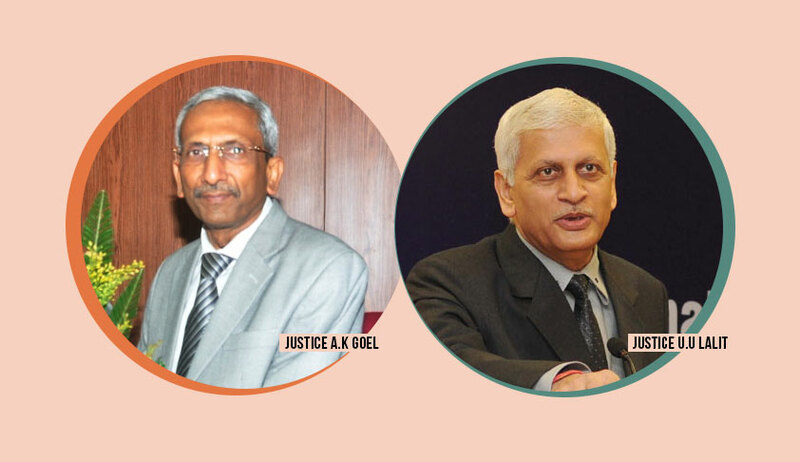 Bar Council of India or the Union of India are at liberty to frame rules in this regard."